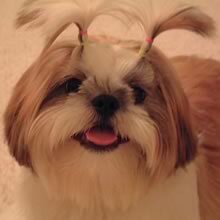 The Shih Tzu is an independent dog which is intelligent, dignified, lovable, affectionate, sociable, and cheerful. It is not as outgoing as most breeds. Shih Tzu seldom bark. James Mumford described the breed in American Shih Tzu magazine as ‘A dash of lion, several teaspoons of rabbit, a couple of ounces of domestic cat, one part court jester, a dash of ballerina, a pinch of old man (Chinese), a bit of beggar, a tablespoon of monkey, one part baby seal, a dash of teddy bear and the rest dogs of Tibetan and Chinese origin.’	The Shih Tzu is an independent dog which is intelligent, dignified, lovable, affectionate, sociable, and cheerful. It is not as outgoing as most breeds. Shih Tzu seldom bark. James Mumford described the breed in American Shih Tzu magazine as ‘A dash of lion, several teaspoons of rabbit, a couple of ounces of domestic cat, one part court jester, a dash of ballerina, a pinch of old man (Chinese), a bit of beggar, a tablespoon of monkey, one part baby seal, a dash of teddy bear and the rest dogs of Tibetan and Chinese origin.’ The Shih Tzu gets along well with other household pets and children. Though the Shih Tzu may bark frequently, it does not make a good watchdog. You can find Shih Tzu puppies priced from $150 USD to $4500 USD with one of our credible breeders. Browse through our breeder's listings and find your perfect puppy at the perfect price. The Shih Tzu’s somewhat obstinate nature makes consistency essential in the training process. Patience is important as housebreaking may be difficult. The Shih Tzu should be taught from puppyhood to relax during the grooming process as it will be a constant throughout the Shih Tzu’s life. Shih Tzu Puppies for Sale - Shipped Worldwide! Finding the right Shih Tzu puppy can be dog gone hard work. PuppyFind® provides a convenient and efficient means of selecting and purchasing the perfect Shih Tzu puppy (or Shih Tzu puppies) from the comfort of your home, 24 hours a day, 7 days a week. Take advantage of our PuppySearch or leisurely browse our directory of hundreds of dog breeds, Shih Tzu dog breeders, Shih Tzu dogs for adoption, and Shih Tzu puppy for sale listings with photos and detailed descriptions. Some Shih Tzu puppies for sale may be shipped Worldwide and include crate and veterinarian checkup. Many Shih Tzu dog breeders with puppies for sale also offer a health guarantee. With thousands of Shih Tzu puppies for sale and hundreds of Shih Tzu dog breeders, you're sure to find the perfect Shih Tzu puppy.